These two magnificent trees are found 90m along a bituminised path originating from the car park of the Lake Barrine, Kiosk / Souvenir shop. The information about these trees is amazing. Their exact age has not been calculated but has been estimated at being in excess of 1100 years. 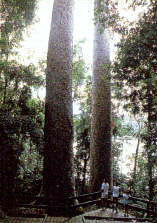 The lakes history has been studied by scientists and these studies have shown that these two trees are the ancestors of Conifer Forest which dominated this area of Queensland prior to the current rainforest. This ancient forest covered these parts over 100 million years ago. There are more fascinating facts about these two trees at Lake Barrine. From The Chambers, follow the road past Lake Eacham. At the junction of the two roads, one leads to Yungaburra and Atherton and the other is unmarked. Both of these roads lead to the Gillies Highway which will take you to the turn off to Lake Barrine and the Twin Kauris.